The August flooding in the Baton Rouge area was cataclysmic. It will take years to rebuild the more heavily damaged areas. 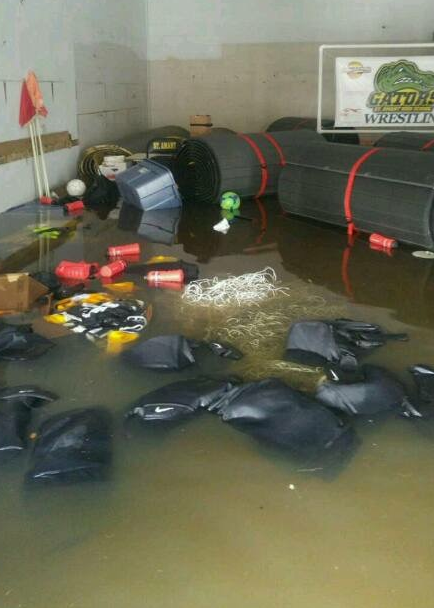 The wrestling community, however, was blessed in that only one school’s wrestling room was a complete loss. The St. Amant High School Gators need help to rebuild their wrestling room by the time the school reopens in late December or early January. That may give them a month to practice as a team before the state championships of February 3rd-4th. Anyone who has experienced such a disastrous event knows how important a semblance of normalcy can be, particularly for students. Wrestlers persevere: They face daunting tasks daily in the practice room or in wrestling events. Present a challenge to them and they will do more than most to overcome it. 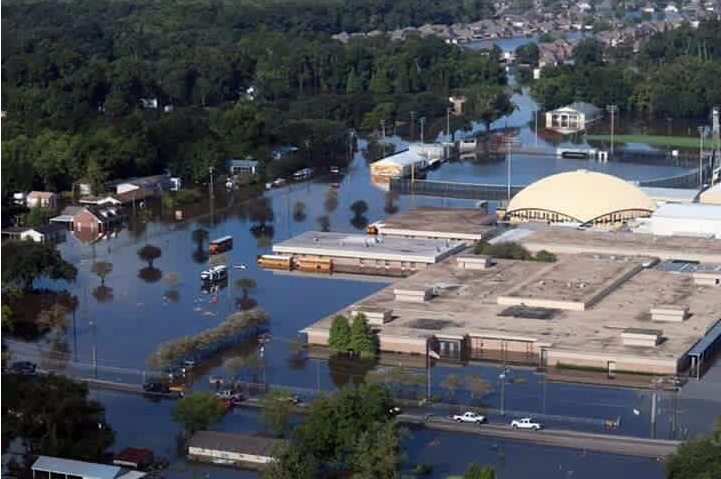 Hurricane Katrina devastated New Orleans in August of 2005, but kids from flooded schools found places to practice. Schools had every excuse not to have a wrestling season in 2005-6, but coaches found a way to prepare their teams for a February state championship. Fifty-nine schools competed in the 2006 Louisiana State Wrestling Championships. That is only seven less than the 66 teams that participated the previous year. Wrestlers take care of their own: This was also shown after Hurricane Katrina when a Jesuit High School alumnus provided a place for rival Holy Cross High School to practice. It was shown when I received two huge boxes of supplies, one from California and one from New Jersey, which gave kids from "hard hit" schools singlets, warm-ups, headgear and shoes. Meteorological sources disagree on the chances of a storm like the one that hit Baton Rouge and its surrounding parishes between August 12th and August 15th. Some say it was a 1-in-500-year rainfall event. Others say it was a 1-in-1,000-year rainfall event. With odds like that, and the fact that Baton Rouge, unlike New Orleans, was not built in an earthen bowl under sea level, many Baton Rouge area residents do not buy flood insurance. Flooding often does not elicit the visceral reactions that hurricanes do. 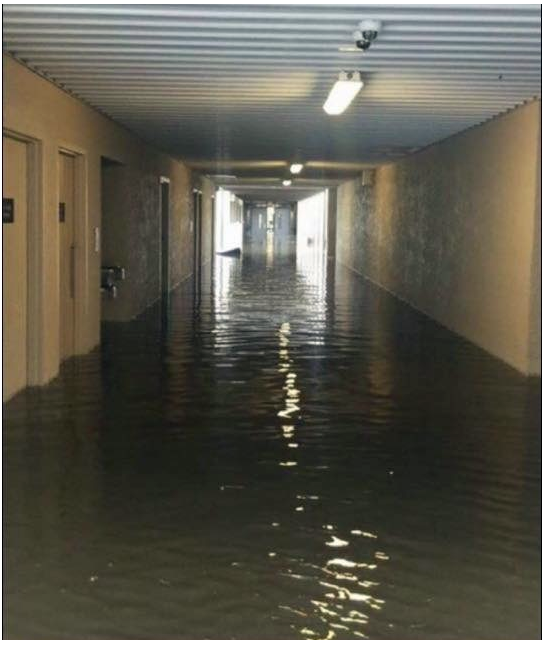 In the Midwest flooding is expected every year. This does not mean they are not to be taken seriously, but the residents of those areas can estimate what is coming their way and prepare for it. In Baton Rouge, however, nobody prepared for a storm that would eventually drop three times the amount of water Hurricane Katrina did in Louisiana in 2005. Nobody expected some areas to receive 19 to 31 inches of rainfall over a 15-hour period. No one expected that eight area rivers demolished their previous flood stage records. Twenty parishes were designated as FEMA federal disaster areas. Over 140,000 homes were damaged by the flooding. In the worst United States national disaster since Hurricane Sandy in 2012, 13 people died. While some wrestling programs suffered moderate damage, the Gators lost everything affiliated with their wrestling program. Make no mistake - flood waters are incredibly filthy and sometimes toxic. One-year-old mats are molding, as are headgear, singlets, shoes and warm-ups. Frankly, that can be said about a lot of the kids' regular clothes as well. Many families are still struggling to put roofs over their heads and food on their tables. Even for the wrestling families, certain things have to come first. As late as September 22nd, more than a month since the waters receded, once in a while one saw a house being rebuilt, as in the photo on the bottom left. 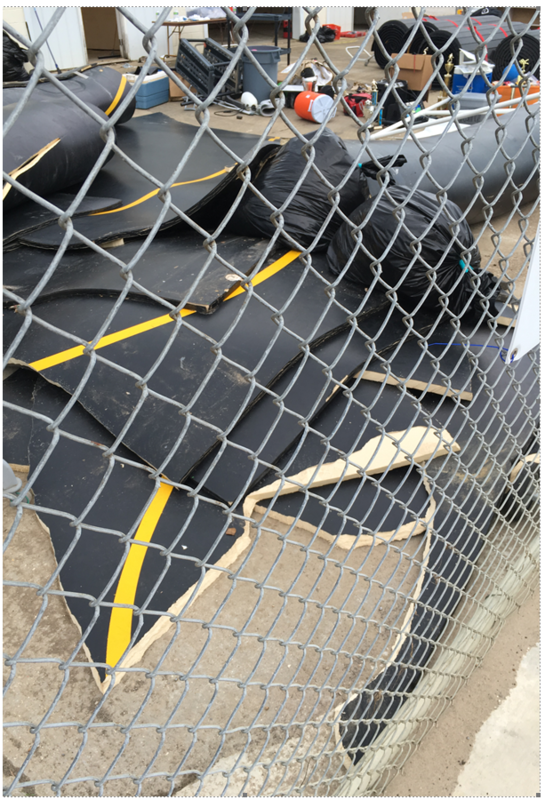 For the most part, though, traveling to or from the St. Amant campus, one finds piles of trash which used to be residents' furniture, clothes, bicycles and toys waiting to be removed. St. Amant students are currently attending classes at Dutchtown High School, which is about eight miles west of the St. Amant campus, via a split-schedule for the Dutchtown and St. Amant students. It is hoped that St. Amant will reopen in late December or early January. The priority of the Ascension Parish School Board, of course, will be that students can attend classes again at St. Amant. No doubt extra-curricular programs will be rebuilt, but when faced with just trying to make the school safe for students, faculty and staff, such programs understandably are not at the top of the school board's list. The Gators only started wrestling in 2001, but by 2009 had two Division I state champions. Last season they had two Division I runners-up and placed 8th at the state tournament. Thirty-seven wrestlers were on their 2015-16 roster. 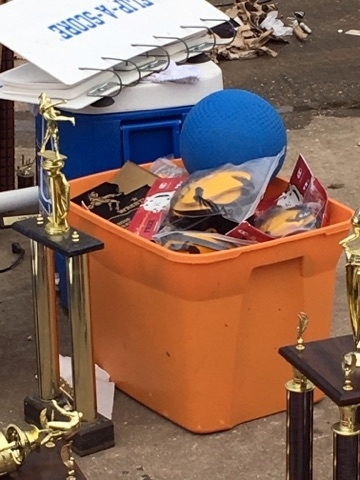 They placed second in the Greater Baton Rouge championships and won the Zachary Big Horse championship for the second consecutive year. Coach Brian Hess, who took over the head coaching job in 2014, and assistant coaches Chase Dupuis and Mike Pernat, have built St. Amant into the strongest program in Ascension Parish and a legitimate top-five placer at the state tournament. The Gators posted a 32-5 dual meet record last season, with two of their losses coming from out-of-state schools and another to the five-time defending Division I state champion Brother Martin. 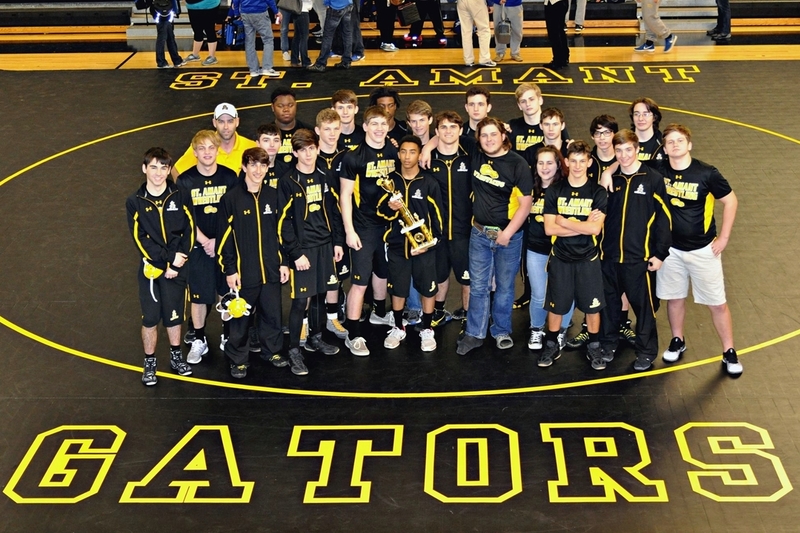 The Gators' 32-5 dual meet record included a victory at their own St. Amant Duals (left). 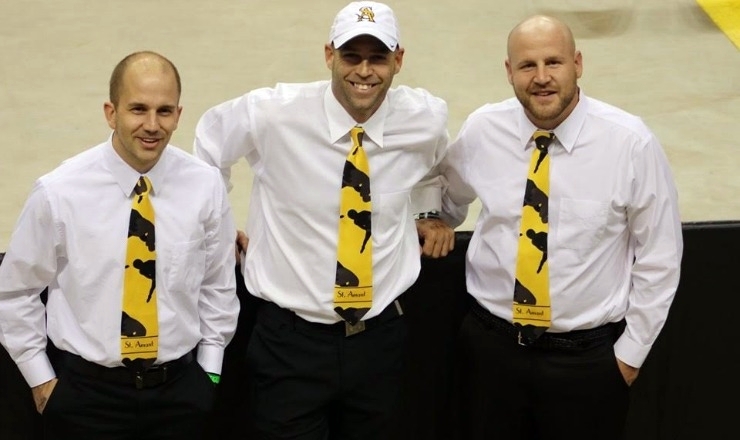 Coaches Chase Dupuis, Brian Hess and Mike Pernat have developed St. Amant's wrestlers into one of the classiest programs in Louisiana. This is where "Wrestlers take care of their own" comes into play. The program has time to move back into a renovated St. Amant wrestling room by the time the school reopens. That would give them at least a month to prepare for the state championships on February 3rd-4th. 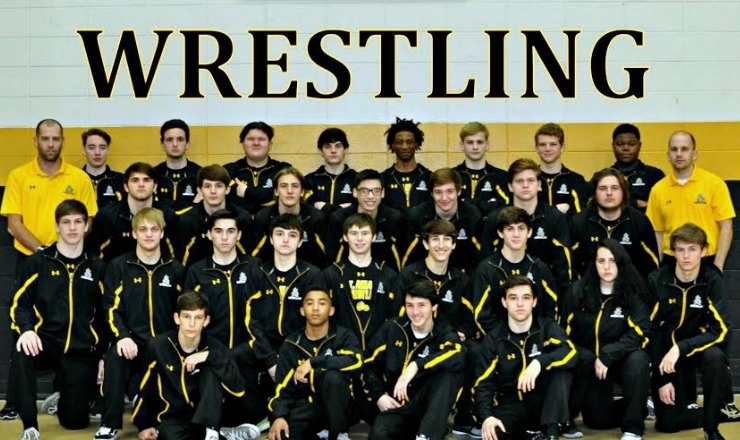 While Dutchtown and the nearby East Ascension High School would be happy to help the St. Amant wrestlers, all three schools are in Louisiana's Division I, making separate practices advantageous to all three schools, particularly since some Dutchtown, East Ascension and St. Amant wrestlers will probably face each other at the state championships. 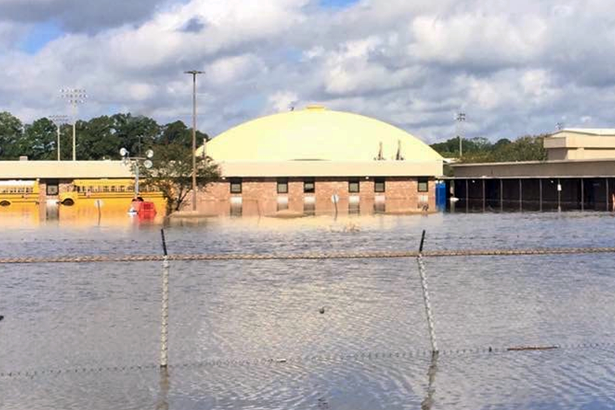 The problem is that the St. Amant wrestlers, coaches and family members cannot afford to rebuild the wrestling room to its pre-storm condition. Many are still trying to find suitable shelter or are in the process of renovating their own homes. They need help. 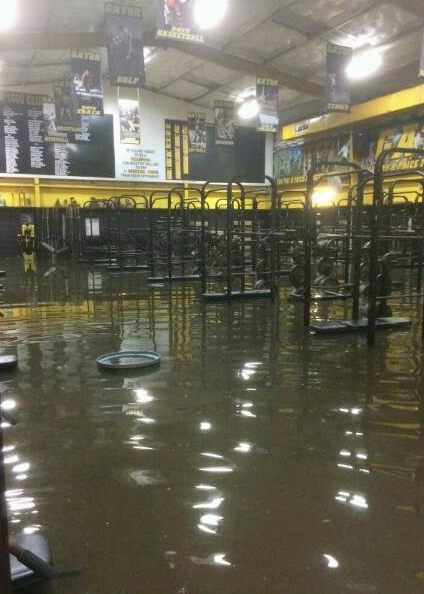 Floodwaters inundated the wrestling storage room and the weight room (left two photos). 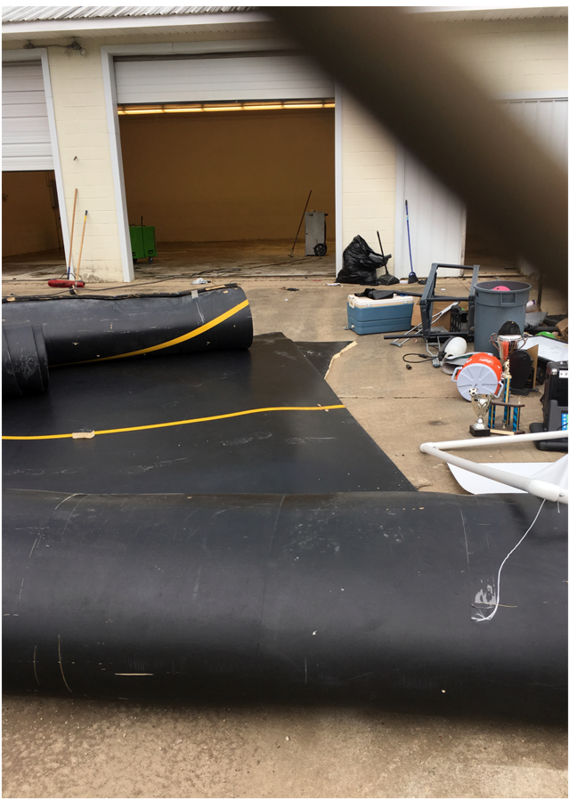 After the water receded, all wrestling equipment was found to be damaged beyond repair (right four photos). The team has created a GOFUNDME Website page to solicit donations to help them be able to rebuild their wrestling room as soon as it is made available to them. 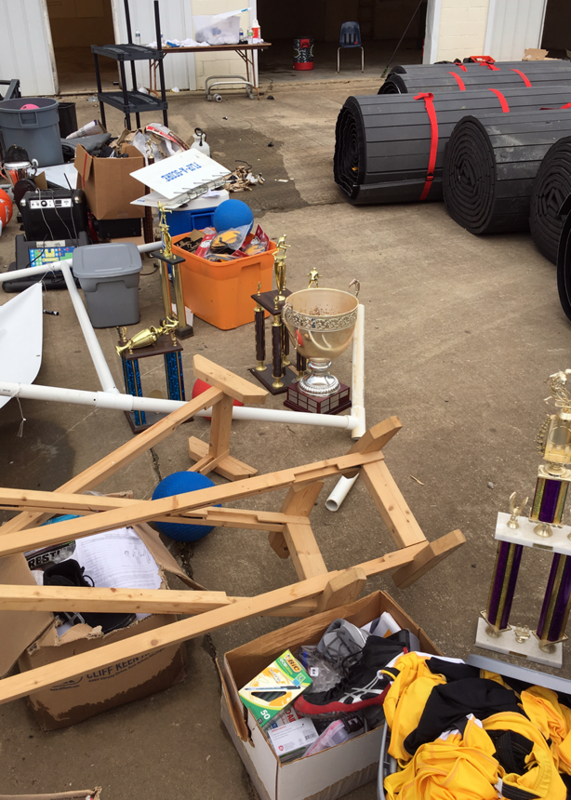 Their initial goal of $20,000 will get them back into the room, but extra funds will be required to restore their wrestling program to the "top notch" condition it was in before the rains came. I am asking that recipients of this post share it with their Facebook contacts as well as other social media outlets. Donations of only $5 or $10 can add up quickly, giving the St. Amant wrestlers a chance to move back into their own practice facility. If you care to assist in some other manner, Coach Hess can be reached at brian.hess@apsb.org or at (410) 430-4255.